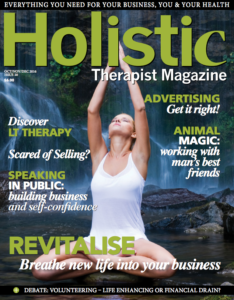 Having popped into my local WH Smiths (other retail establishments are available) to pick up the latest issue of Holistic magazine, I was pleased to see a very effective advertising campaign shining out at me from the inside front cover. 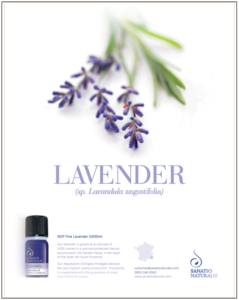 The advert in question was one from Sanatio Naturalis, key provider of pure & natural essential oils, promoting their lavender essential oil. And, I’m pleased to say, this advert was conceived and designed by Design Inc.
Great advertising does not have to have all singing and dancing graphics, it doesn’t have to have a funny message, it doesn’t have to be ‘clever’ – it just needs to be effective. – the goal of the advertisement: awareness campaign? more sales? latest offer? Of course, this part of the advertising process can sometimes take time. But it is always worth it. Without this knowledge, the advertising campaign will just not hit the mark, rendering it completely ineffective. The advertising team at Design Inc pride themselves on creating effective advertising. We want our clients to gain positive results from all they do and we ensure we work closely with them to achieve this success. The Sanatio advertisement is one of a series each of which promotes a different essential oil within their range. Their lavender oil is produced at the highest quality from lavender grown at an altitude of 1400 meters in a rare and protected natural environment: the Verdon Valley, in the heart of the Alpes de Haute Provence. It actually requires 180kg of flowers to obtain just 1kg of essential oil. Natural. Quality. Purity. These were the three key values of the product around which the design brief was established. It became imperative that the advertising campaign matched these values too and, through development, we stripped the advertisement of anything we felt surplus. What was left was a bare advertisement, absolutely pure, unique and memorable, promoting one product, one image, one message and a one word strapline: “Lavender”. In essence, a perfectly effective advertisement. Understand the goal. What do you want the advertisement to achieve. Establish a value proposition. What makes the product/service unique? Who is the ideal audience? How is the advertisement going to reach its ideal audience? print publication? web? social media? out of home? tv? radio? Be relevant to the target market. One message does not always fit all. Be memorable. The longer you can get the audience to remember you, the wider the ‘buying window’. Measuring success. How do you know if the advert has worked? Increased sales and enquiries may not be the only measurable. We have also put together a portfolio of our recent advertising campaigns. Access that portfolio here.